The easternmost parts of China are in fact pretty far east–from there it’s only about 500 more miles east to reach Japan, which is closer than Beijing. The area would be in the same time zone as Korea, if China did not ignore time zones and force everywhere to run on Beijing time. But the easternmost parts of China, which are in the provinces of Heilongjiang and Jilin, are not East With A Capital E: they are not in the officially defined region of East China which every schoolchild learns and which shapes every map and statistical release. 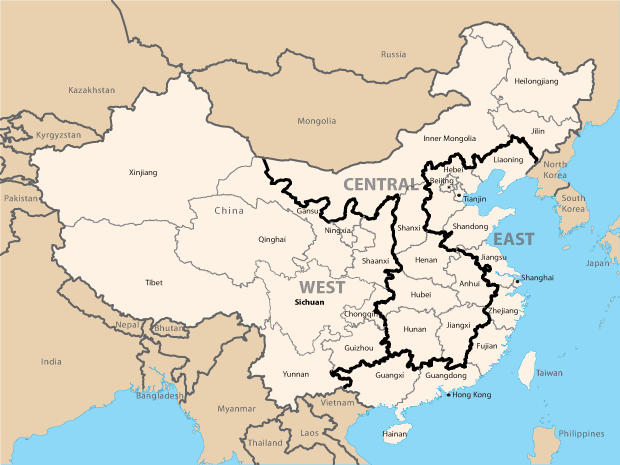 Somewhat bizarrely, the easternmost parts of China are in fact designated as being part of “Central China.” Once I finally absorbed just how weird this is, it became clear to me that these regional categories are not simple descriptions of geographic reality but something more complicated. So why is eastern China not the same thing as East China? As I learned from a classic article by geographer Cindy Fan (JSTOR link), the modern definition of “East China” is in fact an industrial policy program from the early years of the reform era. According to Fan, the current West-Central-East scheme of dividing up the provinces originated in the Sixth Five-Year Plan (1981-85), and was formalized in the Seventh Five-Year Plan (1986-90). The main purpose of the division was to give more favorable treatment to the coastal provinces and focus on developing foreign trade. (As you can see from the map, “East China” includes any province with a coastline, some of which of which are as far west as “Central” provinces.) This decision represented a backlash against the regional policies of the Mao era, which had spread state-sponsored investments–like the infamous “Third Front” military-industrial projects–across the interior in an attempt to narrow regional economic gaps. It was eventually realized that these investments had been generally bad and produced few returns. So rather than try to remove the coast’s historic advantages, the government decided to capitalize on them, and hope the resulting growth would lift the interior provinces as well. Which it more or less did. Although I don’t want to go into too much detail about these programs, it does seem pretty clear that all these measures supporting investment in inland provinces did in fact lead to a lot more investment in inland provinces. There was lots of press coverage about the boom in the western provinces, which were growing faster than the east. 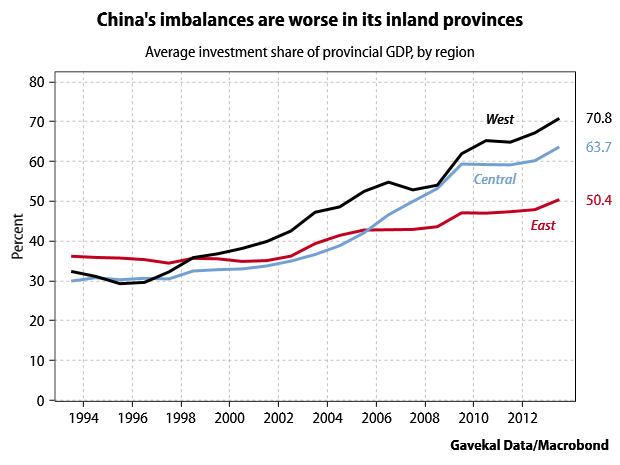 In fact we can see that the much-discussed rise in China’s investment share of GDP is most intense in the inland provinces (the investment share of GDP at the provincial level is not consistent with the same figure at the national level, in part because the national figures attempt to correct for overstated investments in the provincial figures.) To me it seems quite plausible that at least some of this distortion is the result of all these regional development programs. So one of my big questions about the current government has been whether the pendulum will swing back the other way–whether they will, as in the 1980s, get tired of making lots of poor investments in the inland provinces. The general rhetoric of giving a greater role to market forces could certainly imply a lower priority for these regional development programs, which by their nature try to stand in the way of the market forces that tend to reinforce gains in the coastal provinces. There are some interesting signals: in this year’s government work report Premier Li Keqiang said “we will support the eastern region in taking the lead in development”–which certainly sounds like a return to the 1980s-era policies. On the other hand, he continued to endorse the regional development programs for the west, northeast and central regions, which are promised more government funds. But given how hard the current downturn is hitting some inland provinces, in part because of their heavy dependence on mining, my bet is that East China is going to reclaim its leadership position anyway.